On the runway, ready for departure. IATA 3-letter codes, the location identifier code of airports and cities around the world. 3-Letter Codes for World Destinations. would you think that this trigrams are all international identifier codes for destinations around the world? If it comes to aviation, this are in fact IATA codes for cities and airports. FLY is the IATA code for Finley in Australia, EVE for Evenes in Norway, TOY for Toyama in Japan, DAY for Dayton in Ohio, United States, and NYC for sure, New York City. Are you looking for JFK Airport, DFW Airport, LAX , BWI, or IAH Airport. 3-letter location identifier code for airports and cities. Map-Enhanced IATA Code Search™. With this feature you can find the respective airport to a code! Amazing or? To find an airport and its location just type the IATA code after the word 'Airport' and click 'search'! The map will show the location of the respective airport. It will also show the real time (road) traffic situation to and at the airport. This works work for most major international airports. Optional: sure, you also can search by an airport name, a city, state, or country, just try. 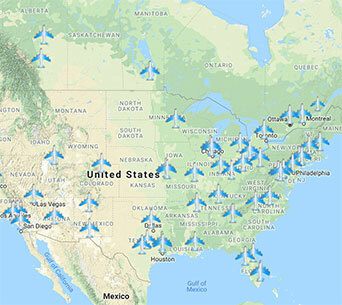 You may also have a look at our city pages, on every city page there you will find the location, a short description, and the IATA code for a city's major airport(s). The maps provide also information about every airport. Searchable Map of Major Canadian and U.S. Airports. World's Top Tourism Destinations by various categories. Compilation of Global Travel Warnings and Travel Advices. A virtual journey to San Francisco, New York, Tokyo, Shanghai, Bangkok, Athens, New Delhi - your choice. See also: Dave English's article "Airport ABCs: An Explanation of Airport Identifier Codes"
Airports ranked by Passenger Traffic 2010. Interactive Map and Satellite View of Major Canadian and U.S. Airports with a short description of the facility. 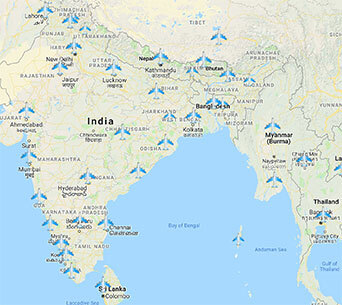 Interactive Map and Satellite View of Major Asian Airports with a short description of the facility. List of US and Canadian International Airports with IATA Codes and Airport Link.